There is a wild raging debate on the Internet about the actual source of Alexander Murray & Co.’s big-age, low-price malts. Some rumors suggest that the majority of the company’s barrels come from Tullibardine (a whisky chameleon of sorts), while the company has definitely bottled Macallan before, and is reported to have contracts with both Diageo and Edrington. This is something new, folks. 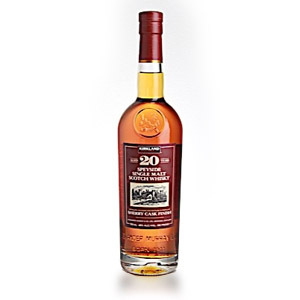 Macallan takes new American oak (NOT ex-bourbon!) and “seasons” it by filling it with sherry for an undisclosed period of time. These “seasoned” American oak sherry casks are then used to age Macallan for at least 12 years. 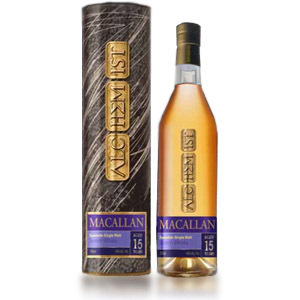 This whisky is then blended with traditional Macallan aged in European oak sherry casks and bottled at 43% ABV. This Travel Retail 700ml bottle, with no age statement, arrives with basically no information on its label about its make-up or provenance. The Internet has revealed that it is comprised of both ex-sherry (the majority) and ex-bourbon casks, and bottled at Distillery Manager Bob Dalgarno’s preferred strength of 42.8% ABV. 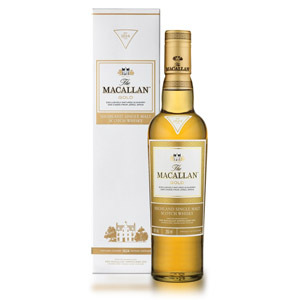 … In an effort to harken back to traditional styles of single malt scotch, Bob sourced some barrels of Macallan distilled from the now-defunct Golden Promise strain of barley. 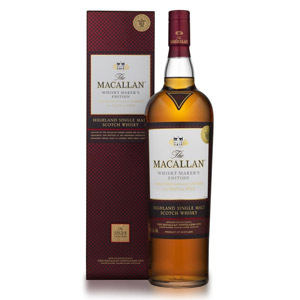 While the bottle does not state an age, it is (according to Bob) comprised of Macallan aged 12 years and up, with “some much older”. Okay so this is very pleasant single malt whisky. It is light and airy, vibrant and youthful (in a good way), and with an array of flowers and fruits that scream “Springtime!” while never becoming cloying, bitter, or overbearing. That said, this is no sherry-bomb. 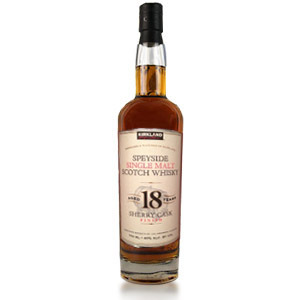 There are no dense red fruits, figs, currants, resin, or anything else commonly associated with the older sherried malts. 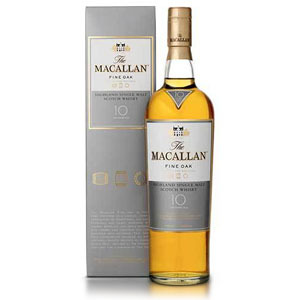 The Fine Oak series, launched in 2004, offered a look at Macallan with some of the sherry stripped away. 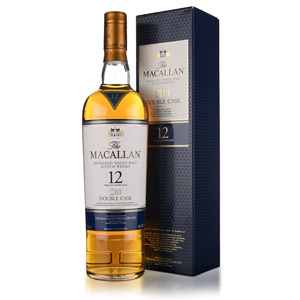 Like The Balvenie DoubleWood, the Fine Oak series is a marriage of traditional Macallan matured in ex-sherry casks, with Macallan distillate aged in ex-bourbon. …There’s a delicate balance of nice fresh black berries with the standard hallmarks of ex-bourbon aging (namely the butterscotch/caramel note that I can never pin down). It’s a well-constructed malt with no obvious flaws. 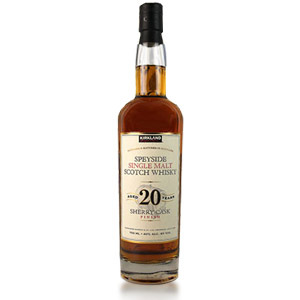 This is 20 year-old malt whisky with no major flaws for under $50. That’s unheard-of, especially in today’s overheated scotch market. If your wallet is hurting from the price hikes on official bottlings of your favorite scotches, and you don’t mind a slight downgrade in quality in your value malts, then I recommend grabbing a bottle while it’s still available. Independent bottlers. Are you paying more and getting less for distillery throwaways? Or will you get lucky and pay bargain dollars for something fantastic that will be gone forever once the last drop is consumed? For some (including me), that’s a lot of gamble for upwards of $50 to $80. On this particular day, I got lucky. Before you can taste it, though, you’ve got to know how to pick a whisky to try! This post will focus on single-malt scotch, which I think is the best possible place to get your bearings in the wider world of whisky. A very different and enjoyable alternative to distillery-released Macallan. It clearly deviates from the distillery profile of sweetness, bright red fruit, and elegant old sherry. Here there are wilder notes and sharper edges. Almost savory at times, and eclectic.